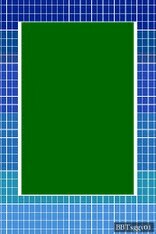 This is a border template set with a blue grid design. Files are included for horizontal and vertical format photos. Each template includes an area at the bottom to customize your photo greeting card.